Cool Off And Have Fun! Summer is here; it’s hot and the kids are home from school – two things that need to be dealt with. How do you keep the kids cool and busy on hot summer days? A trip to a water park is a great family activity, but not for everyday, of course. You can, however create a similar experience at home for a fraction of the cost with some backyard water play! I hope no one misunderstands me and thinks that I’m saying that water play in your own backyard is just as exciting as a water park with all the bells and whistles. It’s not, but it can still be a lot of fun. And it gives kids the opportunity to be creative and imaginative, which is worth a lot, too. Try playing Catch with a water balloon on a hot day! Or almost any other game you’d play with a regular ball. It’s fun because – duh – water play is fun, and because throwing and catching a ball filled with water is funny! How about a game of Limbo where the water sprayed from a hose is the limbo bar? Or a water snake game where someone wiggles a hose and everyone else has to jump over the water as it moves? Fun! Make your own Slip N Slide with a plastic tablecloth tacked to the ground and a hose running over it. A water piñata is another great idea that I saw. 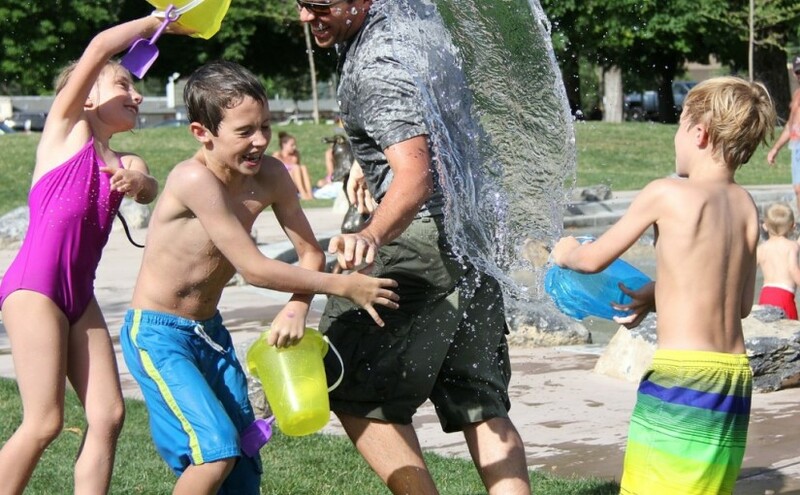 Is getting showered with water on a hot day as much fun as getting showered with candy? Maybe! And here’s one more idea that’s also a project: Buy some spray bottles from the dollar store and let the kids decorate and personalize them with Sharpie markers. Then let them fill them up and have some cool fun!